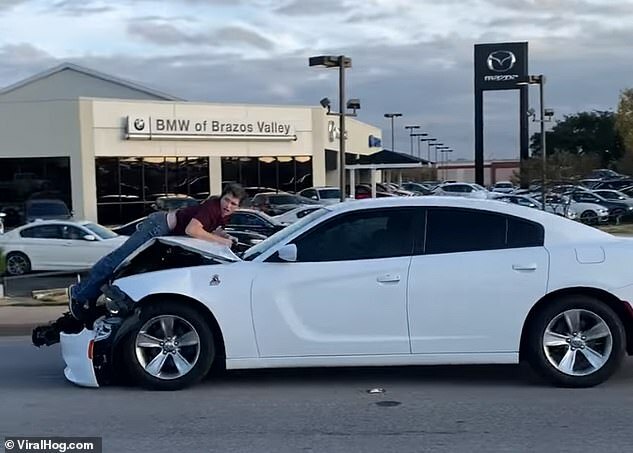 A Texas man has been caught on camera as he managed to avoid being the victim of a hit and run by jumping on the hood of a car and holding on as its intoxicated driver drove away. 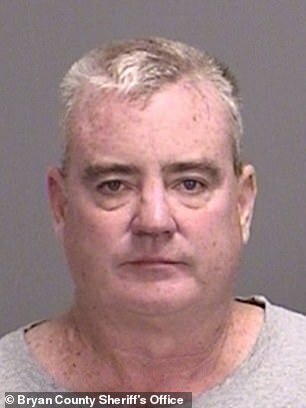 Andrew Allan Bush, 50, of College Station, Texas, was arrested and charged with a DWI, aggravated assault with a deadly weapon and failure to leave information — aka hit and run — according to police in Bryan, Texas, where the incident occurred. 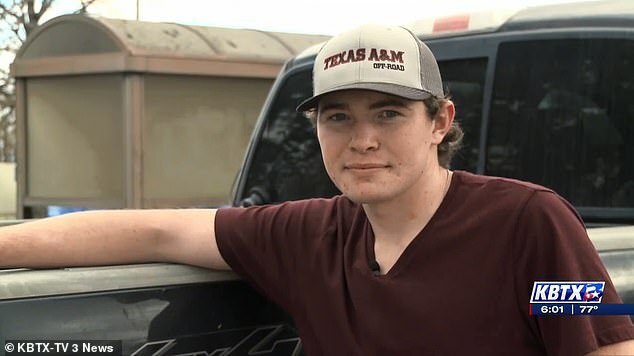 The man on the hood of the car was later identified as Zane Wallace, a Texas A&M student, according to KBTX. 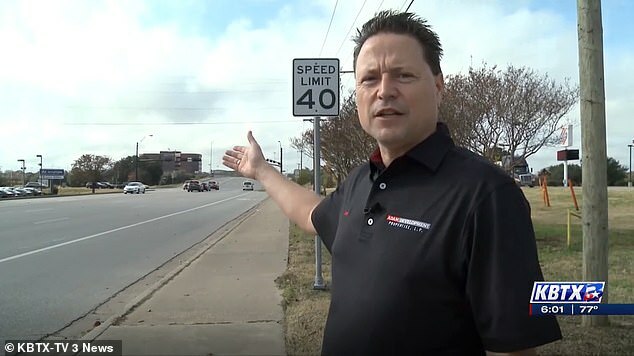 Bystander Steve Christian, of College Station, was stopped at an intersection on November 29 at about 4.30pm in Bryan, when he saw and recorded Bush’s white Dodge Charger as it sped past in the opposite direction, with Wallace clearly clinging to the car’s dented hood. Christian posted the dramatic clip on Facebook and wrote that he had shared the six-second video to the local police department. 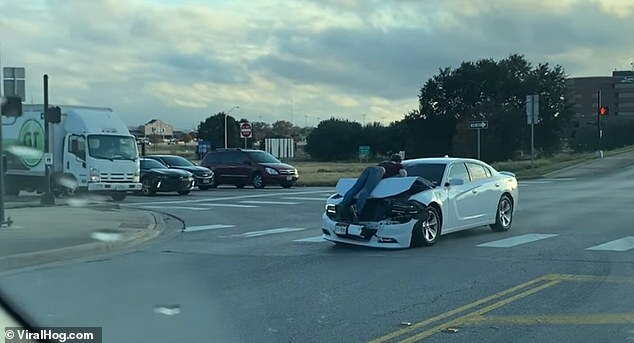 In the video — which has been viewed 95,000 times already — Wallace, wearing jeans and a maroon t-shirt, can be seen holding on for dear life as the white Charger blows through the intersection. At one point, Wallace looks over his shoulder to see where the car is going. Wallace told KBTX that he was driving his truck when the Charger rear-ended him while they were stopped on a bridge. 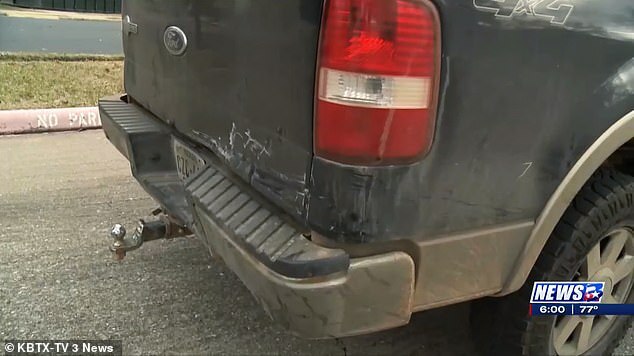 After the impact, Wallace said that he exited his truck to check on the driver, later revealed to be Bush, at which point Bush accelerated his car and drove towards him. Wallace then apparently jumped onto the hood of Bush’s car to avoid being run over as Bush fled the accident scene. Bush drove at speeds of up to 50mph for more than half a mile with Wallace on his hood. Authorities said that during the drive, Bush ‘actively tried to get the victim off of his vehicle,’ before pulling into a gas station. Wallace told the news station that more than six drivers who witnessed the incident had worked together to slow down Bush, ultimately giving him a chance to jump off the hood of Bush’s car without injury. Bush then drove out of the gas station and continued down the street until other drivers, who had witnessed the incident, were able to box him in at a nearby intersection, preventing him from leaving the scene before police arrived. Police told KBTX that Bush admitted to having imbibed a Four Loko drink before rear-ending Wallace and said that he had been scared and uncertain about what to do after the collision. Wallace was taken to the hospital after the incident, appearing to be unharmed except for aches and pains from hanging on to the hood of the car in what he called ‘the best workout ever.’ Wallace’s girlfriend, who was in the truck with him during the collision, was also given medical attention. Bush is in Brazos County Jail with bonds totaling $18,000 for the three charges he faces.